The average tourist who rushes through the town on his way to the New Jersey seashore will probably not notice anything in particular. Perhaps he will make a remark about the exceptionally large number of well kept gardens with beautiful trees and shrubbery. A tourist who has an ear for German sounding names or a college student who ever took a course in German civilization will probably look somewhat perplexed if he opens the local telephone directory or if he sees the names on the street signs. There is Suenderhauf’s Bakery, Weisbecker’s Cleaners, Von Bosse’s Winery, Messinger’s Grocery, Theilacker’s Flower Shop. People live on Hamburg or Bremen Avenues, or on streets named for Beethoven, Buerger, Campe, Claudius, Diesterweg or Duerer. The explanation for this abundance of Germanic sounding names everywhere in Egg Harbor City would have to be found in the early history of the town, a history of exactly one century, because the Egg Harbor story began in 1855. Here as so often in American history the railroads brought a new political and economic impulse. In the year 1854 a new railroad had been built, the Camden & Atlantic Railroad, connecting the big East coast lines running through Philadelphia with the newly opened seashore resort Atlantic City. 2 A railroad was an all-year-round business. It could not exist exclusively on the summer seashore traffic. Thus the railroad company had a vital interest in filling up the demographic white spots in the thinly settled stretches of land between Philadelphia and the coast. Towns would have to be founded along the line. On the Board of Directors of the railroad company there were several men of German descent. They may have conceived the idea of a German settlement. However, this alone does not account for the fact that Egg Harbor City was planned as a pure German town and that this project soon became known to German-Americans all over the country. The decade preceding the Civil War was a time of turmoil and unrest, of tension and prejudice. The biggest wave of anti-immigrant resentment in American history, a nativistic movement called Knownothingism, swept the country. Irish and German immigrants became the main targets for this militant and aggressive group. Germans in Baltimore and Buffalo, in Richmond and St. Louis were haunted by the fear of mob violence and persecution. Many German newcomers who had felt the pressure of the Knownothings were in a receptive mood when they read the advertisements inviting them to a purely German settlement in the New World. It was this combination of two phenomena, both typical of the United States in the midcentury, railroad expansion and anti-immigrant feelings, to which Egg Harbor City owed its existence. When on July 1, 1854 the first train of the new railroad left Camden and puffed eastward, the official party included a good number of prominent German-Americans from Philadelphia, among them William and Henry Schmoele and Philip Mathias Wolsieffer. 3 On November 24, 1854 they organized in Philadelphia a corporation, the "Gloucester Farm and Town Association." In the midst of the New Jersey woods they bought about 38,000 acres, mostly second-growth pine land, on which a German settlement should rise. 4 The first railroad station for the settlement-to-be was named Cedar Bridge. In their initial plans the promoters went completely overboard. They visualized two cities, one, called Pomona, stretching over four square miles immediately north of the railroad tracks. A second city, called Gloucester, should be erected a few miles further north around Gloucester Lake. 5 Soon the scheme of twin cities was dropped and the project was considerably reduced to still unmanageable proportions: one great commercial metropolis and harbor should be built on the seven-mile tract between the railroad and the Mullica River and should be named Egg Harbor City. The Gloucester Farm and Town Association was incorporated on December 14, 1854. The charter of the city bears the date March 16, 1858. 6 The population of Egg Harbor always considered September 1855 the beginning of their history, probably because the first settlers arrived at that time. The far-reaching plans of the promoting Association were revealed in an article by its president, published in the Unabhängige Heimstätte of March 29, 1856. 8 Here, he said, was for the Germans in America the chance to build a flourishing agricultural colony, a great commercial and industrial center and to preserve all the national qualities of the German element in a homogeneous Germanic population. German-Americans, living elsewhere in the United States, might consider a move to the new city. Direct immigration from the German fatherland might be channeled into Egg Harbor to swell the ranks of the settlers. Findet ihr die Heimat wieder. These two lines became a sort of a themesong or leitmotif in the advertising campaign and were frequently repeated as a motto at the beginning of advertisements in German-American newspapers. The Association evidently invested a great deal of money in a vigorous and far-reaching advertising campaign in all American cities with a sizable German population. The waves of propaganda were beamed only to German-Americans or to newly arrived immigrants from German speaking countries. An advertisement in the Baltimore Correspondent in 1858 mentions regular Egg Harbor agents in Philadelphia, New York, Boston, Newark, Buffalo, Cleveland, Baltimore and Washington. 10 Two years later the Association had agents in twenty-nine cities of the United States, as far west as St. Louis and Milwaukee. 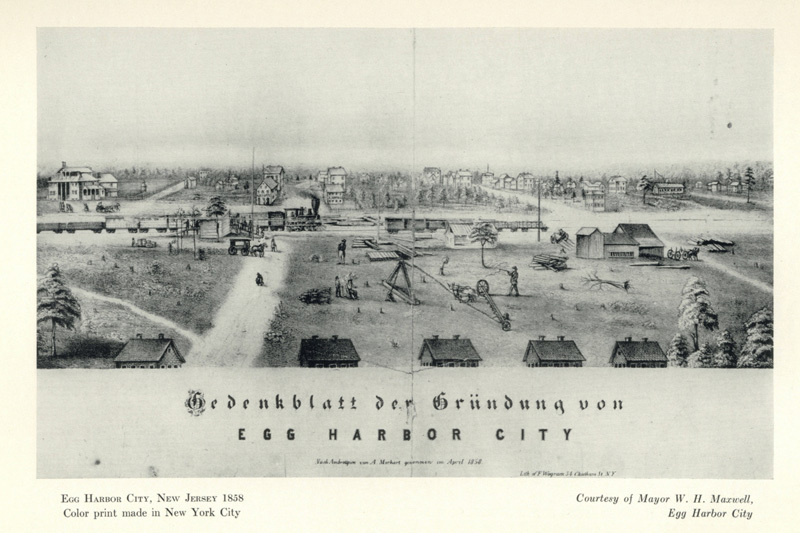 11 Egg Harbor in the fifteen years after 1855 was not a local New Jersey affair, but a nationally advertised German-American undertaking, an experiment which the Germans all over the country watched with intense interest. In the late fifties it looked as if the new settlement really were going to town, or rather to become a town. During the year 1856 the future city area was officially surveyed. In summer 1857 the Governor of New Jersey and a committee of the New Jersey Legislature raised the prestige of Egg Harbor by an official visit. The railroad company again came forward with a little inducement: whoever would build a house within a certain distance of the line, would receive a free railroad ticket for six months and reduced fare for three years. 1858 the first municipal election took place. A citizens’ handbook in German was compiled and published to stimulate the interest in civic affairs. 19 A citizens’ organization, the previously mentioned "Conservative Männerverein," began to make its voice heard in a weekly paper, the Egg Harbor Pilot. "Pilot" in the name of the newspaper, "harbor" in the name of the city reflect the nautical aspirations which hovered over the history of the city in its first years. According to the original plan the Mullica or Egg Harbor River, which was to form the northern boundary of the city, was to be made navigable for seagoing vessels. Egg Harbor City would then be a commercial city with direct waterways to New York and Philadelphia. On the old city map we can still see various "Landing Channels" along the south bank of the river. One street near the projected docks would be called Antwerp Avenue; perhaps the promoters had visions of a port of debarkation for streams of European immigrants. 20 The river at that time must have been accessible to small seacraft, for we hear that in October 1860 the steamer "Huntress" with 150 passengers traveled from New York to Egg Harbor. At the same time schooners with lumber cargo sailed regularly between Gloucester Landing and New York City. This particular hope of the founding fathers actually was fulfilled: Egg Harbor became an exclusively German town and remained such for more than half a century. The town developed all the characteristic features which between 1860 and 1910 came into full bloom in the "Little Germanies" of many American cities. Yet, whereas the Germans in Philadelphia, Columbus or Minneapolis always remained a minority within English speaking surroundings, in Egg Harbor City they constituted the town. Anyone who did not speak German was a foreigner here. Anywhere else the Germans as a racial minority showed a certain tendency to noisy self-assertion, occasionally bordering on aggressiveness, mixed with repeated complaints over lack of recognition and appreciation. In Egg Harbor things were more relaxed. Since there was only one element, there could be no tension. Nobody suppressed the immigrants and if they were not appreciated they could not blame anyone but themselves. The municipal government was organized in 1858. On June 8, 1858 Philip Mathias Wolsieffer was elected the first mayor of Egg Harbor City. 25 On these and the following ballots there was not a single non-German name and so it continued to be during the next fifty years. 26 For more than half a century all business in the City Council was conducted in German. It was only for the convenience of county and state officials that the minutes were kept bilingual. The first entry of these minutes, still preserved in the Municipal Building, shows the date June 18, 1858. On the left page we see the English, on the opposite page the corresponding German text. In this way the Council minutes were recorded until the first World War. Next to the school the most important institution in most German-American communities was the church or rather the churches. Within the first fifteen years four German churches were organized in the town: The Moravian Brethren, the Catholic St. Nicholas Church, the German Reformed Congregation and the Lutheran Zion Church. During the very first years of the colony there was no church. A minister of the Reformed Church, Ulrich Gunther, lived in Egg Harbor for a while and in a true Christian spirit of non-discrimination ministered to each and everyone who was in spiritual need. The Egg Harbor people then applied to the Boards of the Lutheran and of the Reformed Churches for regular preachers, but their pleadings produced no action. Upon the advice of the Rev. Gunther they now made an application to the Home Mission Board of the Moravian Church in Bethlehem, Pennsylvania. The Board explored the situation and in March 1859 sent the first regular preacher to Egg Harbor, the Rev. Christian Israel who organized a Moravian congregation with sixty-six communicants and sixty-three children. 28 Services were initially held in Excursion Hall (the all-purpose community center) and in the private home of one of the members. In 1860 the congregation decided to erect a church, induced by an offer of the Gloucester Association which promised to donate five lots for a church structure on condition that the building be erected in that same year 1860. The Association seizing upon every chance to enlarge and consolidate the settlement made later similar offers to other congregations. Actually the Moravians beat all the others and dedicated their church building on Palm Sunday, 1861. At the end of the fifties the German Catholics in Egg Harbor also began to move. Originally they were part of St. Mary Magdalene of Millville, N. J. Old timers pass on the story that a Father Martin Gessner came over, riding on a white horse to tend the shepherdless flock. After the usual trial period of ambulant services in private homes, St. Nicholas Church, still in use today, was erected in 1863-64. 29 At the same time the bishop indicated that he would send a regular priest if the congregation could pay a yearly salary of four hundred dollars. This was answered in the affirmative and the first priest, Father Yunker, was duly installed. The beginnings of the Reformed as well as of the Lutheran congregations go back to a common start in the year 1859. After the traditional Egg Harbor beginning in Excursion Hall, the Evangelical-Reformed Congregation organized itself in 1862 and affiliated itself with the Philadelphia Classis of the Reformed Church. The Rev. J. P. Pfister served for a brief term, then a colorful personality, the Rev. Anton von Püchelstein took hold of the rudder with a firm hand. Under his guidance the congregation increased to 119 members. He also began the construction of a church building. Notwithstanding such merits, he later figured conspicuously in the annals of the church through his dubious financial dealings and his stubborn (and from his point of view understandable) resistance to produce the accounts. 30 In spite of this and other adversities the congregation lived on and in 1912, when the fiftieth anniversary was celebrated, still gave evidence of its German character. Not the churches or schools, but the singing and gymnastic societies represent the most characteristic features of a true German-American community of the nineteenth century. The trunks of felled trees were still lying around, the streets were still mudholes when in June 1857 the first singing society, Aurora, was founded. 33 As was the case with most societies, it had its period of "storm and stress," but it survived into the twentieth century and for six decades remained the most popular and most respected social organization in town. Founded by a man who stood at the cradle of the two first singing societies in the United States, Philip Mathias Wolsieffer, it soon gained additional prestige when its founder and conductor was elected the first mayor of the town. Well supported by the majority of the citizens, the Aurora interrupted the dullness of every day life by many a concert or theatrical performance. In all such endeavors of community music this German-American generation of 1860, not yet condemned to radio and television, produced an enthusiasm and energy which is probably unparalleled in our time. Nothing unusual for German-American surroundings was an intense interest in amateur theatricals. Two dramatic societies, Dramatischer Club Thalia and Dramatischer Verein Frohsinn, rivaled with one another on the stage. To be sure, the program seldom rose above the entertainment level, yet occasionally the programs showed the best names and titles, such as Mozart’s Zauberflöte, Weber’s Preciosa, Lortzing’s Wildschütz, Schiller’s Räuber, Nestroy’s Till Eulenspiegel, Anzengruber’s Pfarrer von Kirchfeld. More frequently we find the titles of entertaining and melodramatic plays with a broader appeal, such as Schönthan’s Raub der Sabinerinnen, Kotzebue’s Feuerprobe, Charlotte Birch-Pfeiffer’s Goldbauer. There was, of course, also a great deal of fifth grade coarse comedy and ghost drama and we enumerate only a few of these titles which were produced on the Egg Harbor stage: Leonore, die Grabesbraut; Die Glatzköpfe; Der tolle Schneider; Die schlaue Witwe; Ehestands Zwist und Frieden; Einer muss heiraten. Without knowing more than the titles we understand that the editor of the Pilot again and again had to report: "Das Haus war zum Erdrücken voll." The interest in theatrical performances seems to have been rooted very deeply in the hearts of the Egg Harbor people. When it then happened that this beloved institution was attacked, there resulted quite an uproar. Egg Harbor had no Blue Laws. On Sundays, people could meditate or celebrate, worship or dance, go to church or to the theater as they pleased. This liberality produced on Sundays a considerable influx from surrounding towns where people had to live more in the tradition of the American puritans. The Egg Harbor innkeepers praised this happy constellation, the ministers looked at it askance. In the nineties the theatrical activities in the town received new impetus through the arrival of a professional actor Otto Reuter, who on Sunday evenings drew a number of young people as amateurs into his performances when they were supposed to sing in the church choir. All this prepared a dramatic conflict between the actor Otto Reuter and the pastor Georg von Bosse, who induced the mayor to prohibit theatrical performances on Sundays. The columns of the Pilot reflect the wave of indignation that came in the wake of this unpopular ordinance and for several months a war of "Letters to the Editor" was carried out between the pro-Reuter Pilot and the pro-Bosse Beobachter. 35 The episode which had started on a lofty level, discussing the educational mission of the stage, had an ignominious ending: accusations of immoral conduct, a violent marital quarrel between the actor and his wife in the public street, in which he called her "Satansweib," hasty departure of both with destination Brooklyn, in their wake unpaid debts and open scandals . . this may suffice. It must have been one of those cases where a good cause was represented by a bad man. All these organizations met in various halls, inns and taverns with names such as Tonhalle, Turnhalle, Rheinhalle, Germania Halle, Schweizer Halle, Rathskeller, Gambrinus Höhe, Gasthaus zum Hirsch, Gasthaus zur Stadt Augsburg, etc., 36 —names which could be matched in Cologne, Stuttgart or Basel. Still, it is only fair to point out that German-American social life in those decades was more than just folksong and beer drinking. Not everything was Kirmes, Maskenball and Sängerfest, not everything centered around Stein, Handkäs and Sauerkraut. Through many years the Egg Harbor newspapers listed series of lectures of an adult education organization, called Fortbildungsverein. It sponsored talks which were to familiarize the public with the philosophical-scientific outlook of the modern school of thinking, with the works of men such as Feuerbach, Darwin and Haeckel. 37 The Pilot reported regularly about the progress in the fields of the humanities and the natural sciences. In 1869 the paper published a long serialized article on modern pedagogy in the sense of Friedrich Fröbel. 38 As late as 1910 we hear about a "Deutsche Literarische Gesellschaft von Egg Harbor." The roster of societies does not permit any conclusion as to where the Egg Harbor people stood with regard to the controversial political events in Germany in the middle of the century. The settlement was founded seven years after the unsuccessful German revolution of 1848 which brought so many German refugees to America. However, there are no indications that the Forty-eighters played a conspicuous part in the history of this town. 39 To be sure, there were different shades of opinion. The Aurora minutes of October 4, 1857, mention the purchase of a black-red-golden flag, symbol of the liberal German movement of 1848. By and large, the Forty-eighters seem to have avoided the settlement. They had a greater predilection for big cities or at least some atmosphere of urbanity. Egg Harbor in its first ten years meant hard work in brush and field. When the settlement finally took on an air of civilization, the Forty-eighters had scattered widely and taken root elsewhere. We find in Egg Harbor more men of the old German immigration, the so-called "Grays" (such as Wolsieffer and Schmoele) rather than the "Greens," i.e. the post-revolutionary wave of immigration. In general, the atmosphere seems to have been tolerant. If the singing society had acquired a black-red-golden flag in 1857, they also embraced the new black-white-red of the Bismarck empire in 1871: the Aurora gave a charity performance to help the widows and orphans of the Franco-Prussian War and in January 1871 celebrated the end of the conflict and the founding of the German Reich. No other medium permits one to feel the collective pulse of an immigrant group as clearly as its newspapers. No other immigrant group in the United States has produced a more prolific and more diversified press than the Germans. Needless to say, Egg Harbor had its fair share of German newspapers, indeed there were years (at the end of the century) when the city had four of them at the same time. The first Egg Harbor paper grew out of the peculiar origin of the town. The Unabhängige Heimstätte was so to speak the house organ of the Gloucester Farm and Town Association, set up as a means of communication between the "mothering" settlement society and the settlers in the bush. It contained the official records, the proceedings and the news of the Association. We know of it only by hearsay; it must have gone out of existence in 1858. By that time the settlers had organized themselves into what they called " Conservativer Männerverein," with the purpose of terminating certain "abuses" of the officials of the Association and of promoting the interest of the settlers. Their press organ became the Egg Harbor Pilot, the newspaper with the longest and most influential history in the town. In its first year the paper was almost exclusively absorbed with what the Germans call "Kirchturmspolitik," i.e. local affairs in the narrowest sense of the word. In a time when the country was shaken by a Civil War, the Pilot devoted only a few lines to national events. The last issue before the crucial presidential election of 1860 completely ignored the campaign, the first issue after the election dryly reported the result in a few statistical tabulations. 45 Yet, there was in the same issue enough space for a drawn out elegiac contemplation on autumnal beauty, titled "Der Herbst." A headline "Message of the President " does not give the floor to either Buchanan or Lincoln, but turns out to be a message of the president of the Gloucester Farm and Town Association. When in these years the Pilot spoke about the Constitution, it was not the American Constitution but the constitution of the Gloucester Association. Only for the news of Lincoln’s assassination the paper for once stopped being local: the issue of April 22, 1865 appeared with black margins of mourning and devoted its whole first page to the dramatic events in Washington. After the 1904 election the Pilot became as colorless in national politics as it had been in the first decade of its existence. The campaigns of 1908 and 1912 passed without specific recommendations. With regard to the local and state elections the Pilot concluded with an audacious and sweeping gesture that all candidates of all parties for all offices were all "very honorable men." 50 Evidently the struggle for survival had now become more severe. The paper could not afford any more to antagonize that part of the Egg Harbor population which had Democratic leanings. Six years later Carl Schurz died. The Pilot adhered to the old Roman maxim De mortuis nil nisi bene and devoted its entire front page to a very positive evaluation of the life and achievements of Schurz. 56 "One of the greatest Germans in America . . . patriarchal stature . . . awe inspiring with his never stained shield of honor . . . always fighting for the ideals of his country, of freedom, justice and progress . . . A shining example of civic virtues." There was no trace of criticism. The paper hinted sadly at the numerous disappointments which had beclouded the life of the deceased, but failed to add that the intolerant and dogmatic attitude of the Republican German-American press, such as the Egg Harbor Pilot, had contributed a great deal to the disappointments and disillusions in the career of the German-American patriarch. It is much more difficult to gauge the attitude of the Pilot towards the events of European politics. It may be said in general that the German-Americans experienced their most liberal era in the two decades between 1850 and 1870. After 1848 many identified themselves with the liberal movement. From 1870 on the lure of the Bismarck empire proved so strong that most German-Americans somewhat forcibly reconciled their liberal past with the not-so-liberal German present. The Pilot, though generally non-political during the sixties, occasionally showed signs of liberal tendencies. It gave fervent praise to Garibaldi, "the noble leader, the symbol of national virtue," and expressed the hope that also the German people some day would find such a "redeemer." 57 There were a few other symptoms of political liberalism when the paper sharply castigated antisemitic excesses in Rumania. 58 The Pilot showed remarkable independence when, unlike most other German-American newspapers, it published an extremely critical report on the political atmosphere in the Bismarck empire at the occasion of Friedrich Hecker’s famous speech in Stuttgart. It reported the address verbatim under the headline "They want to be neither taught nor converted." 59 Hecker criticized severely the political mechanism of the new empire which had been built from the top, not from the grassroots. "Germany is great as a military power, yet small as a nation, much smaller than in 1848 when it not only wanted to be united, but also wanted to be free." Germany in 1873 meant police regime, lack of social justice and freedom, servility of the officials and brutality of the military (said Hecker), and all this would prevent the German people from using their unity for the higher purpose of civil liberties. Since the Pilot printed Hecker’s widely noticed evaluation of the German Reich without any commentary, we may assume that the editors themselves were not entirely in agreement with the political course in Germany. The literary contributions in the columns of the Pilot hardly ever rose above the level of a provincial German paper. We find some novels and stories by Paul Heyse, Karl Gutzkow, Clara Viebig, Friedrich Spielhagen, Fedor von Zobeltitz, Peter Rosegger, F. W. Hackländer, Alexander Dumas and Otto Ruppius, poems by Uhland and Freiligrath, a series of geographical articles by Alexander von Humboldt. This may suffice to indicate the modest literary ambitions of the editors. In 1879 another paper made its appearance, Der Beobachter, edited by Wilhelm Müller. 66 From 1895 until 1900 Robert Weiler published a weekly Der Fortschritt which then was discontinued on account of illness of the editor. 67 Just as a matter of curiosity we mention that during the carnival season in the last two decades of the century there appeared irregularly scattered issues of an Egg Harbor Carneval Zeitung. Perhaps the most striking manifestation of the German character of Egg Harbor in its infancy is the street map of the planned city. It was drawn up in the late fifties when the founding fathers still had hopes for a metropolis that would stretch seven miles north of the Camden-Atlantic Railroad. We still have this first map which shows the following names for the streets in the West-East direction: Agassiz, Arago, Beethoven, Burger, Campe, Claudius, Diesterweg, Dürer, Egmont, Esslair, Fichte, Follen, Goethe, Gutenberg, Herschel, Humboldt, Irving, Itzstein, Kant, Kepler, Lessing, Liebig, Mendelssohn, Mozart, Naegeli, Neander, Oken, Opitz, Pestalozzi, Pindar, Quantz, Quinet, Rink, Rotteck, Schelling, Schiller, Thalberg, Tell, Uhland, Umbreit, Vogler, Voss, Welker, Wieland, Xenophon, Xylander, Yorick, Ypsilanti, Zelter, Zschokke. This list reflects most impressively the mentality of the people who were the godfathers of the city. A good number of the names honored great men of German letters: Goethe, Schiller, Lessing, Wieland, Claudius, Burger, Uhland, Voss, Opitz, Zschokke. Twice we find the heroes of plays by Goethe and Schiller: Egmont and Tell. German composers appear, such as Beethoven, Mozart and Mendelssohn. Some names taken from the history of German civilization need no further explanation, such as the painter Dürer, the explorer Humboldt, the printer Gutenberg, the educator Pestalozzi, the chemist Justus von Liebig, the philosophers Kant, Fichte and Schelling. Some of these names are still known to an educated German today, but they mean nothing any more to the man on the street, even if he lives on Diesterweg Street. Some of these streetnames are perplexing even to a polyhistor, and we admit that we had to dig deep into encyclopedias of this and the preceding centuries to find explanations for some of the names. Many of these scholars, poets, artists and statesmen never had a street named for themselves in any German city and most of them (like Wilhelm Xylander for instance, a scholar of Roman literature in the sixteenth century) never dreamed that they would have their streets along the Mullica River in the New Jersey backwoods. We enumerated the street names not because we wanted to give a brief index of Western civilization, but because the names permit us to feel the intellectual pulse of the group that organized Egg Harbor City. We notice the high educational level of these men, their obvious interest in literature, music, philosophy, natural science and the political tradition of nineteenth century German liberalism. The names of the avenues running from South to North are likewise indicative of the spirit that promoted the Egg Harbor project. They all are named for cities. Among American cities those were especially honored which were known for their large German sector: Philadelphia, Cincinnati, Baltimore, St. Louis, New York, Buffalo and others. A great German-American influx was expected from these places. The avenues named for world sea ports, such as Hamburg, Bremen, London, Liverpool, Antwerp, Norfolk gave premature honor to prospective partners in world trade. Most of these streets and avenues remained just names on a gigantic oversized map. This old map of Egg Harbor City is an eloquent monument to unfulfilled dreams, a barometer of ‘the maritime aspirations as well as the intellectual climate of the group behind the Egg Harbor experiment. When you drive a few miles north of the city, you will in the midst of the woods, marking nothing but an idyllic forest path, encounter some of these signs, announcing that you now are crossing Uhland Street or Pestalozzi Street, crossings considerably more peaceful than the corner of Lexington Avenue and 86th Street. The first settlers who came to Egg Harbor in 1855 were probably small farmers. Soon after the Civil War various branches of small industry began to develop, the most important: tailor shops, the wine industry, a brick yard, a cut glass factory, a carriage factory, a lumber yard, a brewery, a cigar factory. 68 "Fifty to sixty years ago," Mr. Ernest Beyer, an Egg Harbor old timer, told us, "Egg Harbor had nothing but tailor shops and the wine industry. There were perhaps 25 or 30 tailor shops located in the town each employing from two or three upward. An establishment of a dozen was considered good; a few even had 20 or 25 workers. The working day was about ten hours. Many housewives had coats delivered to their homes for a slight finishing touch, receiving a small amount for their labor. It was an industry that meant much to this city of very industrious people." A bank was founded, two Building and Loan Associations were organized, several hotels were built to accommodate out of town businessmen. The town never became rich, but still fairly prosperous. With tailor shops, cigar factories and other industrial enterprises the town did not differ from hundreds of similar New Jersey settlements. The one feature through which Egg Harbor rose to its own and unmistakable identity was the wine industry. From the first years to the present time this gave its special imprint to the town. It would be interesting to follow up the numerous (and mostly unsuccessful) attempts which German immigrants have undertaken to make wine an acceptable beverage in this country. During the first half of the nineteenth century John Gruber in his Hagerstown Almanac again and again urged his Maryland German farmers to switch from "the stinking whisky" to "the magnificent wine which keeps men healthy, strong and happy." The German settlement of Hermann, Missouri soon after its founding in 1830 became known for its wine raising and established the tradition of an annual wine festival. Kaspar Schraidt, a Forty-eighter, made a name for himself as viticulturist and introduced the cultivation of grapes on the island of Put-in-Bay in Ohio. Herrmann Schuricht, living at the end of the nineteenth century near Charlottesville, Virginia experimented with grape cultivation and made propaganda for it extensively in a German weekly Der Süden. These are only a few examples among many. The Germans of Egg Harbor tried more patiently and more insistently than all others to plant the grape into American soil and the love for wine into American hearts. Alexander Schem, when he entered a few lines about Egg Harbor in his German-American Encyclopedia, 69 mentioned as a special attraction that the town had "herrliches Trinkwasser—magnificent drinking water." The speedy erection of a brewery one year after the founding of the town indicates that the Germans in Egg Harbor lived not only on "Trinkwasser," no matter how good. At the same time, in 1856, the first experiments with grapes were carried out. The pioneers in the wine industry were Ph. M. Wild, F. J. Rödiger and August Heil. Climate and soil seemed to be favorable. In the beginning the wine was made for home consumption. Soon they began to sell it outside of town and state, and in the decades after 1870 the wine industry became the most important source of income for the people. At the Centennial Exhibition in Philadelphia (1876) and at a Wine Exhibition in Paris (1878) the Egg Harbor wines won prizes. The Camden and Atlantic Railroad, the patron saint of Egg Harbor, in 1879 invited a group of prominent men from New York and Philadelphia to a big wine sampling party in town. As guests of the railroad they inspected "the comparatively new and profitable industry of the grape culture and wine making . . . There are between 700 and 800 acres of vineyards now planted in the Egg Harbor district and growing finely." 70 The New Brunswick paper which reported the sampling excursion saw in the production of wine "the greatest agent that could be brought forward in this country in favor of temperance," and it hoped that God would "speed the day when we will be able to produce enough wine in this country to keep young men out of the gin shop and rum mills." Anyone who peruses the old files of the Pilot will see how prominently the cultivation of wine figured in the minds of the Egg Harbor people. Again and again the paper published articles on grapes, many written by Ph. M. Wild. 71 The wine industry soon became a special drawing point for out of town visitors. Many a German-American excursion was organized in Philadelphia, Baltimore, Washington or New York to taste the products of the Egg Harbor vineyards. Particularly around the Fourth of July and again in autumn, the town organized indefatigably a string of festivals: Weinfest, Winzerfest, Weinlesefest, Oktoberfest and other pretexts for fluid hilarity German style. It seems that in the first decades the grape raising was the only really successful venture in town. Most other agricultural, industrial and commercial undertakings had a slow start. A great deal of the financial backing, to which out of town stockholders had subscribed, remained on paper only. In 1857 the great world economic crisis shattered a good many hopes of the Egg Harbor sponsors. 74 The Civil War again retarded the growth of the settlement. Many young men joined the army. A company, organized by a Capt. J. J. Fritschby, fought on the Union side with great bravery. 75 Needless to say, the absence of these young men was painfully felt in the colonization chores of the town. Thus the population grew slowly until the end of the Civil War. Then, however, there was a rapid increase. In fact, the decade before 1870 as a whole saw the proportionately greatest growth of the Egg Harbor population: it almost doubled. In 1868 things looked so hopeful that Veronika Spontowicz, a German midwife, decided to move from Philadelphia to Egg Harbor, where she recommended herself through advertisements running in the Pilot as "geprüfte deutsche Hebamme." These figures show unmistakably that the original sponsors and settlers of the town had to give up their dream that Egg Harbor would become a big city. They likewise had to abandon the fundamental idea of the whole enterprise, the reason for its existence: that Egg Harbor was and would remain an exclusively German city. It is possible to determine almost to the day, when the inhabitants of Egg Harbor decided to let the draw bridges down from the gates of their German dream castle and to step into the realities of American life. The newspaper Pilot, which here as so often revealed the pulse of the population, published an editorial on June 20, 1868 which opened a new chapter in the history of the paper as well as of the town. "Only a few among us still cling to the idea of a purely German settlement. More and more we have learned in the last years that such a restriction within self-imposed limitations would constitute an impediment which makes progress impossible. . . . . We shall rather be American citizens than inhabitants of a German settlement in America." The editorial also pointed out that the tensions between nativistic elements and immigrants had been mitigated and that the idea of complete seclusion was not justified any more. The immediate consequences for the newspaper in this moment were: to give up its political indifference and take part in the next presidential campaign. Apparently in the field of domestic politics the peculiar dilemma of the town had become most pressing: they could not vote German, they had to decide between Republican and Democratic candidates for state and national representation. Egg Harbor City was not an island. Any non-German speaking person who wanted to live there could do so. He would be somewhat isolated, but no law prevented him from taking a job here or opening a store. He would probably do little business if he did not learn German quickly. Towards the end of the century a few colored families moved into town and they soon talked German, in fact, their children spoke it as fluently and free of accent as if they had grown up in Kassel or Kaiserslautern. Another nationality arrived in greater numbers, the Italians. Some were attracted by the wine and grape industry with which they had some familiarity from their Italian origins. Some of them were skilled tailors and found employment in the tailor shops. Some were imported as cheap laborers by the railroad companies. 76 Here was another segment of population with which the Egg Harbor aborigines would have to come to terms. They could not be linguistically annihilated like a dozen negroes. They could likewise not coexist, one part speaking German, the other Italian. Sooner or later they all had to meet on a common platform, as American citizens speaking the language of the country. The various church records likewise reveal the transition from a German to an American town which took place after 1900. The Catholic St. Nicholas congregation was the first to give up German as the language of the church records. From 1859 to 1866 they were in German, from 1866 to 1877 bilingual, after 1877 exclusively English. The first sizable influx of non-German speaking people were the Italians, all Catholics. This explains why the Catholic church was by far the first to move out of the German confines. In 1893 a new church was founded in Egg Harbor City, the German Baptist Church. Starting at a time when German life in town was already declining, this church never flourished. It went through protracted stages of dissolution and was finally disbanded in 1934. Much more successful was the Congregational Church. Organized in 1903 as an English church, when there was increasing need for some church service in English, the Emmanuel Congregational Church was English in the language of the records, the sermons and the social life from the beginning to the present. What the records of the originally German churches and the organizing of English churches indicated in an unofficial way found its official confirmation in the Municipal Building on April 25, 1916. On that day the deliberations of the City Council for the last time were recorded in English and German. From then on the books were kept in English. The fiftieth anniversary of the city in September 1905 was the last great community celebration which reflected the German character of the town. Great gatherings and public parades marked the day. A little book was published which recorded the outstanding events in the history of Egg Harbor and the main accomplishments of its citizens. 80 The German-American press all over the country took due cognizance of the birthday and still referred to Egg Harbor as "the most German town in the country." 81 The German paper in Buffalo summed up its impressions: "Undiluted as in few other communities of the country, Egg Harbor has preserved its German spirit and its German language." Yet, retrospectively it seems to us symbolic that the main day of the festival was marred by a melancholic rain. The difficult years of the first World War only accelerated a development which would have taken place also without the anti-sauerkraut hysteria of the year 1917. The psychological pressure of these years helped to de-emphasize the German components in the texture of the town. Some of the people even gave up the most conspicuous sign of their German heritage, their names. Some of the Morgenwecks (one of the oldest German families in town) changed to Morgan. The percentage of the German element decreased, the Italian element grew. The last census (1950) showed that among 326 foreign born people in town 106 were from Italy and exactly the same number from Germany and Austria. In the telephone directory there is still a great predominance of Teutonic names: Bleibdrey, Butterhof, Einsiedel, Geissenhoffer, Haberstroh, Krauthause, Morgenweck, Obergfell, and assorted Schmidts. Yet, there is also a considerable sprinkling of the clans of Barbetto, Caroccio, Dessicini, Napolitano and Portaluppi. After the First World War Egg Harbor, for many decades the most German community in the country, became an American town, on the surface hardly different from most other towns in the state. Talk to the people and you discover that they are still keenly aware of the German past and of the peculiar history of their town. Yet it is already so remote that it looks to them like the Golden Age. On a cold winter evening they will tell their unbelieving grandchildren with a nostalgic sigh: "Those good old days, when one could buy a big steak dinner for 35 cents, when nobody paid income tax and when German was spoken on every street." 1 According to local tradition the first Dutch settlers entered upon the scenery in spring when gulls and other birds laid eggs in great quantities. Impressed by the sight of the countless eggs they named the place "Eyren Haven," Dutch for Egg Harbor. Alfred M. Heston, South Jersey, A History 1664- 1924 (New York, Chicago, 1924), II, 727. 2 For further details on the ups and downs of the Camden and Atlantic Railroad cf. Heston, South Jersey, II, 719 f.
3 William Schmoele was well known among the Germans in Philadelphia. He was born in Westphalia and studied at the University of Marburg. After his arrival in the United States he became instrumental in the establishment and expansion of some German-American newspapers (Susquehanna Democrat, Pennsylvania Staats-Gazette) and after 1835 made a name for himself as a physician in Philadelphia. He was very active in German-American affairs and helped to organize several building and loan Associations. The Egg Harbor project was very much in line with his interest in cooperative ventures. Georg von Bosse, Das deutsche Element in den Vereinigten Staaten (New York, 1908), 116 f.— Deutsch-amerikanische Geschichtsblatter, X (Chicago, 1910), 141, 144. 4 Heston, South Jersey, II, 745 f. This whole area was generally known as Gloucester Furnace Tract. An iron foundry and furnace had been operated here for many decades.—The minutes of the stockholders meetings of the Gloucester Farm and Town Association are still preserved in the Municipal Building in Egg Harbor City. The first entry is dated November 24, 1854, the last January 5, 1869. 5 In the Municipal Building of Egg Harbor City there is still a little expository pamphlet describing this first monumental plan, Vollständiger Plan der festbegründeten, soliden und volksthümlichen Gloucester Land-und Stadt-Gesellschaft zur Anlegung zweier Städte und 1500 Landgüter in der Nähe Philadelphias, (Philadelphia, Gedruckt bei King und Baird, 1855), 29 pp. 6 New Jersey Session Laws, 1858, Chapter 152. 7 Advertisement in the Baltimore Correspondent, February 3, 1858. Cf. also George F. Breder, (Egg Harbor City, Its Past and Present, Golden Jubilee 1855-1905, (Egg Harbor City, 1905), 13. The various sources of information about the conditions of settlement are not always in accord. They probably underwent some changes within the first fifteen years.—Die neue deutsche Heimath der Gloucester Landgut-und Stadt-Gesellschaft, (Egg Harbor City, 1858, 16 pp. Only copy in the Historical Society of Pennsylvania). 8 Quoted in Breder, Egg Harbor, 13. 9 Breder, Egg Harbor, 15. 10 Correspondent, February 3, 1858. 11 Egg Harbor Pilot, August 18, 1860. We found running advertisements for Egg Harbor in both Baltimore German papers Correspondent and Wecker as well as in the Washington daily Tägliche Metropole. We may well assume that similar notices appeared in most German-American papers around 1860. 12 Correspondent, January 2, 1858. 14 Laurence F. Schmeckebier, History of the Knownothing Party in Maryland, (Baltimore, 1899). 15 The advertisement was signed by Jacob Schmidt, Baltimore agent for Egg Harbor. It was published in the Wecker, October 25, 26, 27, 1858. We found other allusions to the Knownothing conditions in various other advertisements, such as the Correspondent of May 6, 1858 in which Egg Harbor was praised as a rejuvenated free German fatherland, developing the German character in purity and perfection, undisturbed by depraved sons of American freedom, observed with love and admiration by the educated citizens of the country." 16 Correspondent, September 30, 1880. This was an error which was immediately corrected by the Egg Harbor Pilot. The Germans of Philadelphia were the godfathers of the New Jersey town. 17 Actually a considerable sum of money had been spent before 1860. The Pilot of June 23, 1861 gave a rough account for the years 1854-1860. Income $440,500; expenses $405,900. 18 Pilot, May 10, 1860. John F. Hall, The Daily Union History of Atlantic City and County, (Atlantic City, N. J., 1900), 115. Even this arrangement did not last too long. In the years after the Civil War it became clear that Egg Harbor never would fulfill the ambitious plans of the original founders. On January 5, 1869, the association, after having gathered all the liabilities, was dissolved. It was immediately followed by a successor organization, the "Egg Harbor Homestead and Vineyard Company." 19 Der Rechtsfreund, Eine Sammlung besonderer Gesetze und Rechtsbräuche des Staates New Jersey nebst den Municipal Gesetzen von Egg Harbor City, (herausgegeben von Louis Bullinger, Egg Harbor City, 1859), 71 pp. Copy in Municipal Building. 20 In the Municipal Building there is a little pamphlet Plan zur Ausführung des Hafenbaues im Flussdistrikt von Egg Harbor City . . . und Gründung einer Dampfschifflinie zwischen Egg Harbor City und New York, (Egg Harbor City, November 1859, Gedruckt bei Louis Bullinger), 16 pp. 21 Pilot, March 30, 1872. 22 This seal which was adopted in 1858 captures symbolically all the commercial and maritime aspirations, the youthful optimism and the sentimental attachment of the colony: the vessel on the river, a rising sun in the background and a broad oaktree in the foreground. Among the Germans the oak has always been considered their" tree, a symbol for German sturdiness, steadfastness and fortitude. 23 Pilot, May 4, 1860. The embellished reports of the St. Louis paper mentioned an Egg Harbor population of 4,000. The municipal election of the preceding year showed that a total of 139 votes had been cast. 24 Georg von Bosse, Ein Kampf um Glauben und Volkstum, (Stuttgart, 1920), 48. 25 Wolsieffer was born in Winweiler, Rhenish Palatinate in 1808. He emigrated to the United States in 1833, was for a while a music teacher in New Haven, Conn. and Philadelphia, spent a few years in Baltimore where he was conductor of the first singing society, later became secretary of the Gloucester Association. He came to Egg Harbor as one of the first settlers and planted a vineyard. In 1866-67 he was a member of the New Jersey Legislature. Later he left the town and spent the rest of his days in Philadelphia. H. A. Rattermann, Gesammelte Werke, (Cincinnati, 1911), XII, 431-434. Bosse, Kampf, 116 f. Rattermann, Anfänge und Entwicklung der Musik und des Gesanges in den Vereinigten Staaten," Deutsch-amerikanische Geschichtsblätter, XII (1912), 340-342. 26 The names of the mayors during the first half century: P. M. Wolsieffer, Josef Czeike, Moritz Stutzbach, Frank Bierwirth, Louis Ertell, William Darmstadt, Daniel Hax, William H. Bolte, George Müller, Louis Kühnle, Moritz Rohrberg, Theophylus H. Boysen, John Schwinghammer, Frederick Schuchhardt, William Mischlich, Louis Garnich. 27 City Council Minutes, May 25, 1859. 28 Hugh E. Kemper, Directory and Handbook of the Moravian Congregation of Egg Harbor City, N.J., (1934), 12 ff. List of pastors until the end of the century on p. 15. 29 The building project started as early as 1858. In the archives of St. Nicholas there is still a pamphlet Anrede der katholischen Gemeinde in Egg Harbor City, N. J. an ihre Freunde und katholische Glaubensbrüder, denen dieses zur Hand kommen mag, in Beziehung auf den Bau einer katholischen Kirche und anderer religiösen Anstalten in Egg Harbor City, (Philadelphia, 1858). The early church records, here as in the other churches, were kept in German. Those of St. Nicholas Church are now preserved in the Chancery Office, 721 Cooper Street, Camden, N. J. 30 For further details see H. J. F. Gramm, Souvenir Programm der deutschen Evangelisch - Reformierten Gemeinde in Egg Harbor City, (1912). Ministers after A. von Püchelstein were H. Losch, Pastor Dechant, Jakob Dahlmann, M. Frankel, John Bachmann, Adam Böley, Carl Cast. From 1882-1902 the organization was served by the ministers of Glassboro, N. J. and Folsom, N. J. Thereafter a gradual reorganization took place. 31 Georg von Bosse, Festbüchlein zum 25-jährigen Jubiläum der deutsch evangelisch-lutherischen Zionskirche in Egg Harbor City, (1892). Until the end of the century the congregation was served by the following ministers: C. A. Fritze; E. F. Richter; Chr. G. Hiller; Pastor Frank; Pastor Vollquartz; Pastor Causse; H. W. Bähr; H. Rippe; Georg von Bosse. 32 The Rev. Georg von Bosse was born in Helmstedt, Germany in 1862, emigrated to the United States in 1889 and after a few years as assistant minister in Philadelphia served as pastor of the Lutheran Church in Egg Harbor from 1891-1897. Thereafter he was minister in Harrisburg, Pa., Buffalo and Liverpool, N. Y., until in 1905 he accepted the pastorate of St. Paul’s Church in Philadelphia which he held until his retirement in 1930. He also became known as an author of historical writings. He died in Rahns, Pa. in 1943. An account of his life until 1920 is to be found in his autobiography Ein Kampf um Glauben und Volkstum (1920). Cf. also New Yorker Staatszeitung und Herold, April 29, 1943. 33 Material gathered from Festschrift zum 50-jährigen Jubiläum des Gesangvereins Aurora (1907). The pamphlet was compiled from the minutes which in 1907 were still available. It covers the history of the society year by year; in many instances it is the only source for the history of other Egg Harbor societies. 34 The Gloucester Farm and Town Association donated the land for the farm under very favorable terms. The members raised $4,000 for the farm and even entertained ambitious plans for a big agricultural institute in Egg Harbor. Information was gathered from a pamphlet Rede von Andrew Lutz, Präsident des landwirtschaftlichen Central-Vereins von Nord-Amerika, gehalten bei der ersten General. Versammlung in Egg Harbor City, (New York, 1863). 35 Pilot, June 7, 21, August 18, 25, 1894. Bosse, Kampf, 62-65. 36 Names gathered from advertisements in the Egg Harbor Pilot. 37 Pilot, July 17, October 23, 1880. 38 The author was a resident of Egg Harbor City, Dr. Emil A. Damm, who also recommended himself in the advertising section of the paper as a tutor in Greek, Latin, French and English. 39 In these same years the people of Northern New Jersey saw the beginnings of a German Settlement which was founded in the tradition of the Forty-eighters. This was the town of Carlstadt, built on a ridge between the Hackensack and the Passaic Valleys. The land had been bought cooperatively by liberal German refugees and freethinkers. Named for Dr. Carl Klein, the leader of the group, this settlement was (as the Baltimore Wecker of October 5, 1858 expressed it) based on " the principles of a social republic." To our knowledge, the history of this interesting colony has never been told. 40 Pilot, November 10, 1860; November 7, 1868; November 7, 1874; November 8, 11, 1884. After the election of 1884 three hundred citizens organized a torch parade to celebrate Cleveland s victory. 41 Pilot, November 12, 1892. 42 Pilot, November 7, 1896; November 10, 1900. 43 Pilot, March 6. 1909. 44 Until now practically nothing had been known about the Egg Harbor Pilot except the name. The Union List of Newspapers does not list a single copy as extant. There is a brief mention in two statistical compilations, New Jersey Newspapers in 1874 " in Proceedings of the New Jersey Historical Society, New Series, XV (1030), 262, and Die deutsche Presse in den Vereinigten Staaten " in Der Deutsche Pionier, VIII (1876), 294. We were extremely fortunate in locating an almost complete file of the Pilot from 1860 to 1915. The first year is in the possession of Mr. George W. Otto of Egg Harbor City, who has the entire second volume from March 22, 1860 to April 6, 1861. Most of the remainder, from 1862 to 1915, was until recently in the hands of Mr. A. H. Kroekel of Philadelphia, a son of the last owner and editor of the paper. Mr. Kroekel has now deposited this entire file in the Rutgers University Library. Two anniversary articles of the Pilot (March 12, 1904 and March 6, 1909) clarify the history of frequently shifting ownerships. In the following we list the names of the owners. Often (not always) owner and editor were identical: 1860-1868, Hugo Maas; 1868-1869, A. Stephany and Franz Scheu; 1869-1871, Franz Scheu; 1871, Louis Bullinger, A. C. Morgenweck; 1871-1879, A. C. Morgenweck and Hugo Maas; 1877-1881, Hugo Maas and Charles Kroekel; 1881-1904, Hugo Maas; 1904-1915, Charles Kroekel. Most of these men lived in Egg Harbor for the greater part of their lives. Franz Scheu’s name later figured prominently in the history of the German press in Delaware as editor of the Delaware Pionier and the Wilmington Freie Presse. 45 The local result for Egg Harbor was: 85 votes Republican, 53 Democratic. 46 Pilot, June 13 and 20, 1868. 47 Pilot, June 15, 1872. 48 Pilot, November 7, 1896. 49 Pilot, November 5, 1904. 50 Pilot, November 2, 1912. 51 Pilot, June 15, November 2, 1872. 52 Pilot, August 5, 1876. 53 Pilot, August 23, 1884. 54 Pilot, August 30, 1884. 55 Pilot, September 29, October 20, 1900. 56 Pilot, May 19, 1906. 57 Pilot, June 14, 28, 1860. 58 Pilot, March 30, 1872; also March 4,1882. 59 Pilot, August 23, 1873. The headline referred to the criticism which Hecker’s speech had evoked from the National-Liberal German Party. 60 Pilot, August 6, 1898. 61 The last issue of the Pilot available in the Kroekel file, Rutgers University Library, is no. 52 of vol. 56, dated February 20, 1915. The last editor-owner of the paper was Charles Kroekel. Born in Braunschweig, Germany in 1855, he came to the United States as a boy of ten. His parents settled in Egg Harbor. Very active in public and civic affairs Charles Kroekel was connected with the Pilot in one capacity or other from his fifteenth year until the paper was discontinued. He died in Philadelphia in 1938. 62 Baltimore Wecker, December 3 and 15, 1858. The Beobachter was published and edited by Louis Bullinger. Cf. also Hall, Atlantic County, 123 f.
63 Pilot, December 8, 1860. The last issue of the Aurora (no. 13) was dated November 28, 1860. There seems to be a distinct connection between the rising sun in the official city seat and the name Aurora, used for one of the first newspapers and for the oldest singing society in town. 64 Pilot, November 7, 1874. "Die deutsche Presse in den Vereinigten Staaten," in Der Deutsche Pionier, VIII (1876), 289-320; Egg Harbor papers listed on p. 294. According to this source the Zeitgeist had a circulation of 500, while the Pilot had only 200 at that time. Cf. also "New Jersey Newspapers in 1874," Proceedings of the New Jersey Historical Society, New Series, XV (1930), 262. During the nineties, however, the Pilot boasted repeatedly that it was not only the oldest paper in the county, but also had the biggest number of subscribers. 65 Bosse, Kampf, 59 f.
66 We do not know how long this Beobachter lived. The only copy known to be extant, in the possession of Mr. G. W. Otto of Egg Harbor City, is Vol. VII, no. 19, dated April 9, 1887. It shows a rather intensive interest in political matters at home and abroad. 67 Pilot, February 24, 1900. 68 Breder, Egg Harbor, 41 ff. ; 109 ff. 69 Deutsch-amerikanisches Conversationslexicon (New York, 1871), IV, 22. 70 New Brunswick Daily Freedonian, September 26, 1879. Reprinted in the Proceedings of the New Jersey Historical Society, LXXI (1953), 295-297. Also Breder, Egg Harbor, 65. 71 The Pilot (March 5, 1864) mentioned that the district around Hamburg Avenue was commonly called Lateinisches Viertel—Latin Quarters." Here a goodly number of academically trained people had settled. Many of them were wine growers. 72 Pilot, October 24, 1863. 73 Pilot, October 3, 1896. This statement, however, is completely contradicted by the Rev. von Bosse, Kampf, 202. 74 William Schmoele said in a speech, delivered at the twenty-fifth anniversary of the town in fall 1880, that initially $600,000 had been subscribed by German-Americans all over the country. He also mentioned the dampening effect of the year 1857. Baltimore Correspondent, October 13, 1880. See also Pilot, October 16 and 23, 1880. 75 Heston, South Jersey, 745. William Schmoele in his anniversary speech of 1880 said that 86 men from Egg Harbor went to war and that only 40 returned. 76 The Pilot of March 22, 1890 reported the arrival of not less than eighty Italian immigrant laborers for the Reading Railroad Company in only one month. 77 Pilot, advertisements in April 1592. 78 The Atlantic Democrat for the greater part of its history was in the hands of the Regensburg family. Moritz Stutzbach was editor of the Atlantic Journal. In one instance the same man published a German and an English paper: George F. Breder owned the Zeitgeist (later Herold) and the Egg Harbor Gazette. Cf. Hall, Atlantic County, 123 f. Breder, Egg Harbor, 53. 79 The Lutheran ministers preached only German sermons until around 1930. Thereafter, there were German and English services alternately, after 1944 English every Sunday, German every second Sunday. The Lutheran Church received some German speaking influx after the Second World War through Displaced Persons from Baltic countries where the Lutheran faith was predominant. 80 George F. Breder, Goldenes Jubiläum, Egg Harbor City (1905). Significantly the last fourth of the booklet is in English. 81 Articles appeared for instance in the New Yorker Staatszeitung, September 10, 16, 18, 19, 1905; Baltimore Correspondent, September 10, 1905 Buffalo Democrat, September 16, 1905, reprinted in Deutsch-Amerikanische Geschichtsblätter, VI (1906), 6 ff. The unique history of Egg Harbor City, from the founding of the settlement until the time when the town lost its German identity, has never been told. The comprehensive German-American histories (Faust, Cronau, Bosse and others) have ignored it. The various series of periodicals on German-American history (Deutsche Pionier, Deutsch-Amerikanische Geschichtsblätter, American German Review) never dealt systematically with the subject. The publications of the New Jersey Historical Society, issued for more than one hundred years, were scrutinized carefully and yielded no information. The greatest drawback so far for any historical research was the complete disappearance of Egg Harbor German newspapers. The author therefore was particularly fortunate in locating an almost complete file of the most important German newspaper of the town, the Egg Harbor Pilot. Special thanks is due to its former owner, Mr. A. H. Kroekel of Philadelphia who made this wealth of untapped source material available to the author and now placed the entire file in the Rutgers University Library. Among the many people who assisted the author in collecting the widely scattered material for this article the name of the Rev. Hennig von Bosse of Egg Harbor City should be mentioned first. This research could not have been done without his help. His readiness and cooperativeness, his kindness and hospitality can never be praised too highly. Others who gave valuable assistance are Mr. W. H. Maxwell, Mayor of Egg Harbor City; Mr. John Schuster, City Clerk of Egg Harbor City; Mr. George W. Otto of Egg Harbor City; Mrs. Hildegard Von Bosse Kropp of Brooklyn, N. Y.; Mr. Howard G. Bruneman of the United States Bureau of Census in Washington, P. C.; Mr. Roger H. McDonough of the State Library of New Jersey in Trenton, N. J.; the late Mr. Ernest Beyer of Linwood, N. J. and the ministers of the various churches in Egg Harbor City. Anon., Festschrift zum 50-jährigen Jubiläum der Gesangvereins Aurora, (Egg Harbor City, 1907). Bosse, Georg von, Ein Kampf um Glauben und Volkstum, (Stuttgart, 1920). Bosse, Georg von, Fest büchlein zum 25-jährigen. Jubiläum der deutsch evangelisch-lutherischen Zionskirche in Egg Harbor, (Egg Harbor City, 1892). Breder, George F., Egg Harbor City, Goldnes Jubiläum, 1855-1905, (Egg Harbor City, 1905). Cunz, Dieter, "German Street Names in Egg Harbor," American-German Review, XXII (1956), iii, 27-29. Gramm, H. J. F., Souvenir Programm der deutschen Evangelisch-Reformierten Gemeinde in Egg Harbor City, (Egg Harbor City, 1912). Hall, John F., The Daily Union History of Atlantic City and County, (Atlantic City, N. J., 1900). Heston, Alfred M., Absegami, Annals of Eyren Haven and Atlantic City, 1609-1904, (Camden, N. J., 1904, 2 vols.). Heston, Alfred M., South Jersey, A History 1664-1924, (New York, Chicago, 1924, 2 vols.). Kemper, Hugh E., Directory and Handbook of the Moravian Congregation of Egg Harbor City, (Egg Harbor City, 1934). DR. DIETER CUNZ, author of The Maryland Germans and numerous articles on German-American immigration history, is Professor of German at the University of Maryland, College Park, Md. For more than ten years he has been editor of the annual bibliography "Americana-Germanica." Copyright © 1956, The Society for the History of the Germans in Maryland . Cunz, Dieter. "Egg Harbor City: New Germany in New Jersey." Report of The Society for the History of the Germans in Maryland 29 (1956): 9-30. PO Box 22585, Baltimore, MD 21203. Last updated: 2008 Eighth Month, 30th.